The project titled FMR Imaging of the Eye Stabilization Process is an extremely invasive experiment that involves not only multiple surgeries, but also water deprivation. The animals are subjected to a great deal of routine handling and daily confinement to a restraint chair, both of which are highly stressful for the primate. 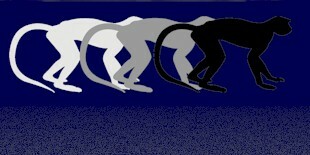 Also, as part of the experiment, the primate is subjected to time in the magnetic bore of an fMRI machine. To prepare the primate for the experiment, the Principle Investigator first performs a series of surgeries which allow him to bolt recording devices onto the animal’s skull. Two metal strips to which a head restraint bar will be attached are bolted onto the primate’s skull. Later, holes are bored into the monkey’s skull to allow electrodes to be fed into the animal’s brain. 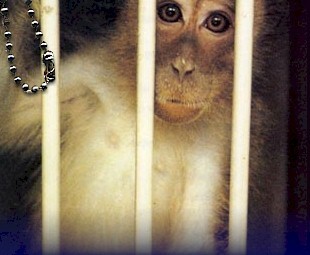 Teflon coated metal coils are implanted behind the primates eyes. The experiment also calls for a rigid water restriction regime in which the primate is denied water for 20 hours each day for 5 day blocks. 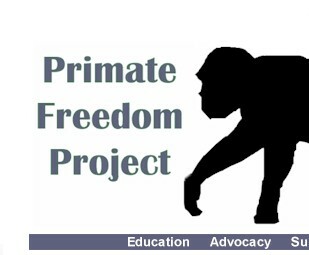 During experimental procedures, the primate is confined to a restraint chair for 3 to 5 hours. The head restraint pole embedded in his skull is bolted to the chair to immobilize his head. Water is given during this time as a reward for good behavior. When the procedure is over and the primate is returned to his home cage, water is again withheld for the next 20 hours. At the end of the experiment, the primates are exsanguinated—bled to death. In the experiment Evaluation of Brain Death on Islet Recovery and Functionality in Primates, experimenters insert catheters into the skull of a monkey. By inflating a small balloon within the catheter, they are able to increase the pressure within the head and cause a rapidly progressive brain injury which leads to brain death. After brain death is achieved, but before the animal is killed, the scientists open the primate’s abdomen and remove his pancreas. In the experiment A New Approach to the Xenotransplantation in Primates, genetically modified pancreatic cells from pigs are transplanted into the livers of primates. A large midline incision is must be performed on the primate as part of the transplant. Despite the highly invasive nature of this procedure, analgesics are only given for three days following the surgery. After the transplants, the animals are also subjected to liver biopsies and lymph node biopsies aswell. • According to this monkey’s necropsy report, “he was a self mutilator with an extended period of lesion healing and re-injury. Self injurious behavior is a serious indication of behavioral disturbance and stress often exhibited by singly housed primates. Isolation is extremely distressful for primates. • ID # RQ2820: Another monkey, a 3 year old rhesus macaque suffered from chronic colitis. The overall poor condition of his Gastro-Intestinal tract mirrors the “necropsies of several of these undersized young macaques with multiple bouts of diarrhea, weight loss and general failure to thrive.” Undersized primates with chronic colitis are clearly very unhealthy and this condition sounds as if it is rather common. • A 2 year old female macaque, primate ID# CP7B, was found to be “in poor health.” The veterinarian found that she was “both too small and too thin.” Due to chronic inflammation of the Gastro Intestinal tract, she was treated for inflammatory bowel disease, although the condition persisted until her death. • One primate, ID# 98P162, was infected with SIV, a monkey form of HIV. In his necropsy report, it is noted that he was lame in left leg with a swollen ankle. 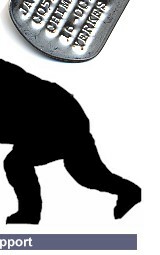 The resulting disuse of his limb led to arthritis and atrophy of the muscle and bone.